This disc is a long-awaited sequel to Hyperion’s disc of Spohr’s Clarinet Concertos Nos 1 & 2, recorded by the same forces. It was at Gotha in the autumn of 1808 that Spohr met the clarinet virtuoso Johann Simon Hermstedt, and the two men hit it off straight away. Spohr immediately began work on his first clarinet concerto. Hermstedt was so taken by the work that—rather than insisting on the composer modifying some of his more outlandish, and unplayable, demands—he adapted and expanded his instrument to suit the music, thus bringing about important developments in the range and flexibility of the clarinet, expanding it from five keys to thirteen. 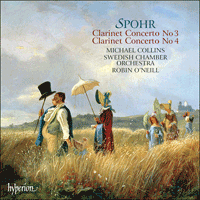 Of the four concertos Spohr wrote for Hermstedt, the Third is the most overtly virtuosic, with a fiery restless energy supporting grand, sweeping themes of real distinction. The Fourth ranks among Spohr’s finest compositions. Louis Spohr was one of the most significant personalities in German music in the first half of the nineteenth century, equally outstanding as a composer, violinist, conductor, teacher and organizer who was considered a leading pioneer of early Romanticism. During his lifetime he ranked as a member of the pantheon of the great composers, his music played and loved by thousands. Gradually, he slipped from this Olympian height but in more recent decades he has enjoyed something of a revival, mainly fuelled by his delightful chamber music including the Nonet and the Octet (on Hyperion CDA66699) and the Double Quartets (on Hyperion Dyad CDD22014), but also by his four concertos and other works for clarinet which have been taken up by many of the world’s finest exponents of that instrument. Spohr, who was born in Brunswick on 5 April 1784 and died in Kassel on 22 October 1859, was a twenty-year-old violin virtuoso who shot to fame after receiving rapturous reviews for a concert in Leipzig on 10 December 1804. The following year the young composer was offered the post of Music Director at the enlightened court of Gotha and, at twenty-one, he became the youngest incumbent of such a position in the whole of Germany. So worried were his Gotha employers by his youth that they publicly declared him to be a few years older—a perhaps necessary stratagem when deference to age and experience was the norm. It was at Gotha in the autumn of 1808 that Spohr met the clarinet virtuoso Johann Simon Hermstedt (1778– 1846), the wind band director at the nearby court of Günther Friedrich Carl, Prince of Schwarzburg-Sondershausen. Hermstedt’s princely employer despatched his clarinettist to Gotha to commission a concerto from Spohr and the two men hit it off straight away. Both worshipped Mozart, both were Freemasons like their hero, and Hermstedt had originally trained as a violinist, so they had a lot in common. The friendship was probably cemented more firmly at one of their first concerts together when they played Mozart’s Clarinet Quintet with Spohr on first violin. Their fruitful partnership puts them in the company of Mozart and Anton Stadler, Weber and Heinrich Baermann, and Brahms and Richard Mühlfeld, three great composers and the clarinettists who inspired them to produce some of their finest works. So it was with Spohr and Hermstedt. Spohr immediately began work on his Clarinet Concerto No 1 in C minor and took it to Sondershausen in January 1809 to go through it with Hermstedt. At the time, while Spohr was familiar with the range of the clarinet, he knew little about its strengths and weaknesses and planned to adjust his score in the light of Hermstedt’s advice. But the clarinettist liked the concerto as it was and assured Spohr that he would adapt and expand his instrument to suit the music. And so he did, thus bringing about important developments in the range and flexibility of the clarinet, expanding it from five keys to thirteen. Hermstedt’s modifications and alterations were detailed in a preface to the first publication of the concerto as opus 26 in 1812. Hermstedt gave the first performance of the concerto at Sondershausen on 16 June 1809 and then took it on tour. It was an enormous success and cemented Hermstedt’s reputation as the leading clarinet virtuoso of the day, challenged only by Weber’s favourite, Baermann. Naturally, Hermstedt was keen for more so in 1810 Spohr wrote his Clarinet Concerto No 2 in E flat major, Op 57, as well as two short concert pieces, the Variations in B flat major, WoO15, on a theme from his opera Alruna (1809) and the Potpourri in F major, Op 80 (1811), on two themes from Peter von Winter’s then popular opera Das unterbrochene Opferfest. As a return favour, Hermstedt played in the orchestra in November 1811 when Spohr’s opera Der Zweikampf mit der Geliebten was first staged and the composer featured his clarinettist in a special obbligato aria ‘Ich bin allein’, which he later transferred to his 1813 Faust. Spohr next met up with Hermstedt in Vienna, where the composer had accepted a post as orchestral leader at the Theater an der Wien, which he held from 1813 to 1815. Victory over the French resulting in Napoleon’s exile to Elba led to allied diplomats descending on the Hapsburg capital for the Congress of Vienna, and musicians saw their chance to profit from the occasion. Beethoven, Weber and Spohr were among those who produced patriotic cantatas while Hermstedt arrived in autumn 1814 to join in the music-making. The clarinettist was much taken with a recent Potpourri of Spohr’s for violin and harp and beseeched the composer for a clarinet arrangement. Spohr obliged with the Fantasie and Variations on a theme of Danzi in B flat major Op 81, usually heard in the version for clarinet and string quartet. Spohr left Vienna in March 1815 to resume the life of a touring violin virtuoso though he kept in touch with Hermstedt, composing a Notturno in C major, Op 34, for the Sondershausen wind band. After a long-awaited visit to Italy Spohr became director of the Frankfurt opera (1817–19), before he was back on the road with trips to London and Paris. He, his wife and their three daughters eventually settled in Gandersheim, the home town of Spohr’s parents, and it was there in May 1821 that Hermstedt turned up with an urgent request. The directors of the baths at the spa town of Alexisbad wanted Spohr to give a concert during the forthcoming summer season and Hermstedt pressed Spohr for another concerto which he promised to play at that event. The composer complied and his Clarinet Concerto No 3 in F minor WoO19 was given its premiere by Hermstedt at Alexisbad on 27 July 1821. However, the evening proved something of a disaster as far as the audience were concerned. Spohr recollected that a tremendous thunderstorm along with torrential rain erupted and the noise drowned out any attempt at music. Eventually the storm subsided and the concert began but the late start meant it was midnight before it ended. Then the audience discovered that the storm had flooded the surrounding valley, trapping them for the night. Food and shelter were in short supply and many guests had to spend an uncomfortable night sleeping on straw in the baths before they were able to make their escape at daybreak. The third concerto is the most overtly virtuosic of the four with a fiery, restless energy supporting grand, sweeping themes of real distinction. The music best matches what we know of Hermstedt’s musical personality: a staggering technique and a fearless disregard of even the most severe difficulties. Some contemporaries hinted that his playing lacked finesse but all acknowledged the sheer excitement generated by his performances. At the close of 1821 Spohr’s career reached a major turning point with his appointment as Kapellmeister at the court of Kassel and he remained there for the rest of his life. It was in Kassel that he composed the Clarinet Concerto No 4 in E minor WoO20, sketched in August 1828 and orchestrated in January 1829. It ranks among Spohr’s finest compositions and received its premiere in Hermstedt’s hands on 12 June 1829 during the Nordhausen Musical Festival where the composer demonstrated his continuing love for Mozart by taking the viola part in a performance of the latter’s Clarinet Trio, K498. The finale, a Rondo al espagnol, appears on the surface to be a joyous, good-humoured movement but there is an underlying feeling of sadness emphasized by the E minor tonality that dominates proceedings. The opening theme of the work is echoed in the arpeggio figuration at the close. Spohr had earlier used a Spanish finale in his sixth violin concerto, composed in the winter of 1808–9 after hearing a Spanish soldier quartered on him in Gotha play his native melodies on a guitar, and he turned to this Spanish inspiration for a number of further works including a string quartet and an opera as well as this clarinet concerto. It will be be noticed that in neither of these two clarinet concertos is space found for a cadenza as the composer thought that cadenzas pandered to the worst side of solo instrumentalists and he generally shunned them. Both the third and fourth concertos remained unpublished and unknown because Hermstedt retained possession of the manuscripts until his death in 1846. Spohr wrote in his memoirs that he knew nothing of the fate of either work and it was not until the centenary year of the composer’s birth in 1884 that clarinet and piano arrangements were printed. At the same time manuscript performing material also became available on hire but this was not widely publicized, and it has been left to our own times to rediscover these fine concertos. Their revival was helped by the discovery in 1960 of Spohr’s autograph score of the fourth concerto, leading to a scholarly edition in 1976. Sadly, the third concerto still languishes only in manuscript copies, but interest in Spohr’s other concertos has led clarinettists to seek this one out too. Spohr composed only one more work for Hermstedt. In the late summer of 1837 the clarinettist wrote on behalf of Princess Mathilde of Schwarzburg-Sondershausen, daughter-in-law of the prince, to commission a set of soprano songs with clarinet obbligato, the Sechs deutsche Lieder, Op 103. Hermstedt, who was approaching the end of his career, included two of the songs in his final concert in August 1841. He had served his composer well for Hermstedt inspired an overall total of ten works with clarinet solo which stand as a group among Spohr’s most inventive and attractive compositions. Louis Spohr compta parmi les grands musiciens allemands de la première moitié du XIXe siècle: compositeur, violoniste, chef d’orchestre, professeur et organisateur remarquable, il fut l’un des chefs de file du romantisme naissant. Il appartint, de son vivant, au panthéon des grands compositeurs et sa musique fut jouée, adorée par des milliers de gens. Puis il glissa peu à peu de cet Olympe avant de connaître, ces dernières décennies, une sorte de résurrection, essentiellement due à sa ravissante musique de chambre—le Nonet et l’Octuor (Hyperion CDA66699), les Doubles quatuors (Hyperion Dyad CDD22014), mais aussi des œuvres pour clarinette, dont les quatre concertos, reprises par nombre des meilleurs clarinettistes mondiaux. Né à Brunswick le 5 avril 1784 et mort à Kassel le 22 octobre 1859, Spohr, violoniste virtuose, se fit un nom à vingt ans, après avoir été encensé par la critique au lendemain d’un concerto donné à Leipzig le 10 décembre 1804. Jeune compositeur, il se vit proposer, l’année suivante, le poste de Kapellmeister à la cour éclairée de Gotha, devenant, à vingt et un ans, le plus jeune titulaire d’une telle charge en Allemagne. Ses employeurs furent si inquiets de sa jeunesse qu’ils le vieillirent publiquement de quelques années—un stratagème peut-être nécessaire à une époque où prévalait la déférence envers l’âge et l’expérience. Ce fut à Gotha, à l’automne de 1808, que Spohr rencontra le clarinettiste virtuose Johann Simon Hermstedt (1778–1846), qui dirigeait l’orchestre d’instruments à vent à la cour voisine de Günther Friedrich Carl, prince de Schwarzburg-Sondershausen. Ce dernier avait dépêché Hermstedt à Gotha pour commander un concerto à Spohr. Immédiatement, le courant était passé entre les deux hommes: adulant Mozart, leur héros, franc-maçon comme eux, ils avaient beaucoup en commun, d’autant que Hermstedt avait d’abord appris le violon. Leur amitié se renforça certainement lors d’un des premiers concerts qu’ils donnèrent ensemble: ils interprétèrent le Quintette avec clarinette de Mozart, Spohr tenant le premier violon. Ce fructueux partenariat leur assura une place parmi les Mozart et Anton Stadler, Weber et Heinrich Baermann, Brahms et Richard Mühlfeld—trois grands compositeurs et les clarinettistes qui leur inspirèrent parmi leurs plus belles œuvres. Sans attendre, Spohr s’attela à son Concerto pour clarinette no 1 en ut mineur et l’emporta à Sondershausen en janvier 1809. Car s’il savait l’étendue de la clarinette, il en méconnaissait les forces et les faiblesses et projetait donc de revoir, d’ajuster sa partition à la lumière des conseils de Hermstedt. Or ce dernier aima le concerto tel quel et affirma à Spohr qu’il adapterait et développerait son instrument en fonction de la musique. Ce qu’il fit: il améliora énormément l’étendue et la flexibilité de la clarinette, qui passa de cinq à treize clefs. Ces modifications et ces altérations furent détaillées dans une préface à la première édition du concerto, publié sous le numéro d’opus 26, en 1812. Hermstedt créa l’œuvre à Sondershausen le 16 juin 1809; puis il l’emmena en tournée, remportant un immense succès qui scella sa réputation de premier clarinettiste virtuose de son temps (son unique rival était Baermann, qui avait la préférence de Weber). Naturellement, Hermstedt en redemanda et Spohr lui écrivit, en 1810, le Concerto pour clarinette no 2 en mi bémol majeur, op. 57 ainsi que deux courts morceaux de concert: les Variations en si bémol majeur, WoO15, sur un thème de son opéra Alruna (1809), et un Potpourri en fa majeur, op. 80 (1811), sur deux thèmes d’un opéra de Peter von Winter alors en vogue, Das unterbrochene Opferfest. En retour de ces faveurs, lorsque Spohr monta son opéra Der Zweikampf mit der Geliebten (novembre 1811), Hermstedt joua dans l’orchestre et apparut dans «Ich bin allein», une aria obbligato spéciale que le compositeur allait reprendre dans son Faust de 1813. Devenu chef d’orchestre au Theater an der Wien (1813–15), Spohr retrouva Hermstedt à Vienne. Suite à la victoire sur les Français, qui se solda par l’exil de Napoléon à l’île d’Elbe, les diplomates alliés se réunirent dans la capitale des Habsbourg pour le congrès de Vienne. Les musiciens virent là une chance à saisir: Beethoven, Weber et Spohr furent de ceux qui signèrent des cantates patriotiques; quant à Hermstedt, il arriva à l’automne de 1814 pour participer à l’élaboration de la musique. Enthousiasmé par un récent Potpourri pour violon et harpe, il pria Spohr de lui écrire un arrangement pour clarinette. Ainsi naquit la Fantaisie et Variations sur un thème de Danzi en si bémol majeur op. 81, souvent jouée dans sa version pour clarinette et quatuor à cordes. En mars 1815, Spohr quitta Vienne pour reprendre sa vie de violoniste virtuose itinérant. Il n’en garda pas moins le contact avec Hermstedt et composa un Notturno en ut majeur, op. 34 pour l’orchestre de Sondershausen. Après un séjour très attendu en Italie, il dirigea l’opéra de Francfort (1817–19) puis reprit la route, voyageant à Londres et à Paris. Il finit par s’installer, avec sa femme et leurs trois filles, à Gandersheim, la ville natale de ses parents. En mai 1821, encore à Gandersheim, il reçut une demande des directeurs des thermes d’Alexisbad le priant instamment de se produire en concert lors de la prochaine saison estivale. Pressé d’écrire un nouveau concerto par Hermstedt, qui s’engagea à venir le jouer, il composa le Concerto pour clarinette no 3 en fa mineur WoO19, que le clarinettiste créa dans la ville d’eau le 27 juillet 1821. Hélas, la soirée fut une manière de désastre pour le public. Spohr se souviendra: un terrible orage éclata, avec des pluies torrentielles, et le fracas couvrit toute tentative de musique. Une fois la tempête enfin apaisée, le concert put commencer mais avec un tel retard qu’il ne s’acheva pas avant minuit. Les gens découvrirent alors que la tempête avait inondé la vallée alentour. Pris au piège, manquant de nourriture et d’abri, de nombreux invités durent passer une nuit désagréable, à dormir sur de la paille, dans les thermes, avant de pouvoir s’échapper à l’aube. Le troisième concerto est le plus ostensiblement virtuose des quatre: une énergie farouche, nerveuse, soutient de grandioses et larges thèmes doués d’une réelle distinction. Cette musique cadre à merveille avec ce que nous savons de la personnalité musicale de Hermstedt: une technique stupéfiante et un mépris intrépide des pires difficultés. D’aucuns insinuèrent à l’époque que son jeu manquait de finesse mais tous s’accordèrent à relever l’enthousiasme absolu soulevé par ses interprétations. À la fin de 1821, Spohr fut nommé Kapellmeister à la cour de Kassel, ce qui marqua un tournant dans sa carrière. Il y resta jusqu’à sa mort et y composa le Concerto pour clarinette no 4 en mi mineur WoO20, esquissé en août 1828 et orchestré en janvier 1829. Cette œuvre, l’une de ses plus belles, fut créé par Hermstedt le 12 juin 1829 lors du Festival de musique de Nordhausen. À cette occasion, Spohr démontra aussi son intangible amour de Mozart en assumant la partie d’alto du Trio avec clarinette, K498. Le quatrième concerto, le seul composé par Spohr pour la clarinette en la, s’ouvre Allegro vivace sur un thème sombre, d’allure romantique, que vient contraster un second sujet plus serein; mais cette atmosphère détendue est ébréchée par de puissantes, quoique brèves, explosions orchestrales. Le Larghetto, réfléchi et mélancolique, recèle des touches opératiques émanant de passages déclamatoires et d’arpèges dramatiques. Le finale, un Rondo al espagnol, semble joyeux et bon enfant, mais il renferme une tristesse sous-jacente, qu’accuse la tonalité de mi mineur prévalante. Le thème d’ouverture trouve un écho dans la figuration arpégée terminale. Spohr avait déjà utilisé un finale espagnol dans son sixième concerto pour violon, composé à l’hiver de 1808–9 après avoir entendu un soldat espagnol cantonné chez lui, à Gotha, jouer des mélodies de son pays à la guitare; il puisa dans cette inspiration espagnole pour plusieurs autres œuvres, dont un quatuor à cordes, un opéra et le présent concerto pour clarinette. Estimant qu’elle flagornait le pire côté des solistes, Spohr se passait généralement de cadenza, comme dans ces deux concertos pour clarinette. Les concertos nos 3 et 4 demeurèrent inédits et inconnus, Hermstedt en ayant détenu les manuscrits jusqu’à sa mort, en 1846. Dans ses mémoires, Spohr dit tout ignorer du sort de ces deux œuvres et ce fut seulement en 1884, année du centenaire de sa naissance, que parurent des arrangements pour clarinette et piano. Concomitamment, il devint possible de louer un matériel d’exécution manuscrit mais on ne le fit guère savoir et ce fut donc à notre époque qu’incomba la redécouverte de ces beaux concertos. Leur résurrection se trouva facilitée par l’exhumation, en 1960, de la partition autographe du concerto no 4, qui déboucha sur une édition scientifique en 1976. Hélas, le concerto no 3 attend toujours d’être redécouvert. Nous ne le connaissons qu’à travers des copies manuscrites, mais l’intérêt pour les autres concertos de Spohr a mis les clarinettistes sur sa piste. Spohr ne composa qu’une seule autre pièce pour Hermstedt, pour honorer une commande que ce dernier passa par écrit, à la fin de l’été de 1837, au nom de la princesse Mathilde de Schwarzburg-Sondershausen, belle-fille du prince. Il s’agit d’une série de chants pour soprano avec clarinette obligée, les Sechs deutsche Lieder, op. 103. Alors en fin de carrière, Hermstedt en inclut deux dans son ultime concert (août 1841). Spohr aura donc été bien servi par ce virtuose qui lui inspira dix œuvres avec clarinette solo, dix œuvres comptant parmi ses pages les plus inventives et les plus séduisantes. Louis Spohr war einer der bedeutendsten deutschen Musikerpersönlichkeiten in der ersten Hälfte des 19. Jahrhunderts und zeichnete sich gleichermaßen als Komponist, Violinist, Dirigent, Lehrer und Organisator aus. Man hielt ihn für einen führenden Wegbereiter der frühromantischen Musik. Zu seinen Lebzeiten stellte man ihn sogar in das Pantheon der großen Komponisten, seine Musik wurde aufgeführt und von Tausenden geliebt. Nach seinem Tod nahm sein Ruhm allerdings Schritt für Schritt ab. In den letzten Jahrzehnten erfreut sich Spohr nun wieder größerer Beliebtheit, die sich hauptsächlich auf seine herrliche Kammermusik stützt, wie zum Beispiel das Nonett und Oktett (bei Hyperion CDA66699), die Doppelquartette (bei Hyperion Dyad CDD22014), aber auch seine vier Konzerte und andere Werke für Klarinette, deren sich viele führende Klarinettisten der Welt angenommen haben. Der zwanzigjährige Violinvirtuose Spohr, der am 5. April 1784 in Braunschweig geboren wurde und am 22. Oktober 1859 in Kassel starb, gelangte nach dem überschwänglich rezensierten Konzert am 10. Dezember 1804 in Leipzig schnell zu Ruhm. Im darauf folgenden Jahr wurde dem jungen Komponisten die Stelle des Konzertmeisters am aufgeklärten Hof in Gotha angeboten. Mit 21 Jahren war er so der jüngste Inhaber einer Konzertmeisterstelle in Deutschland. Seine Arbeitgeber in Gotha machten sich über sein Alter immerhin so viel Gedanken, dass sie ihn öffentlich als ein paar Jahre älter ausgaben—womöglich ein notwendiger Schachzug in einem Zeitalter, in dem man vorrangig Alter und Erfahrung schätzte. In Gotha traf Spohr im Herbst 1808 den Soloklarinettisten Johann Simon Hermstedt (1778–1846), Leiter des Hautboistenkorps am nahe gelegenen Hof des Fürsten von Schwarzburg-Sondershausen Günther Friedrich Carl. Hermstedts fürstlicher Arbeitgeber hatte seinen ersten Klarinettisten nach Gotha abgeordnet, um bei Spohr ein Klarinettenkonzert in Auftrag zu geben. Spohr und Hermstedt verstanden sich sofort hervorragend. Beide verehrten Mozart, und beide waren Freimaurer wie ihr Vorbild. Zudem hatte Hermstedt ursprünglich Violine studiert. So gab es vieles, was Spohr und Hermstedt verband. Ihre Freundschaft wurde wahrscheinlich in einem ihrer ersten gemeinsamen Konzerte noch mehr vertieft. Da führten sie nämlich Mozarts Klarinettenquintett auf, und Spohr spielte die erste Violine. Ihre produktive Partnerschaft lässt sich mit der von Mozart und Anton Stadler, Weber und Heinrich Baermann oder Brahms und Richard Mühlfeld vergleichen, drei außerordentliche Komponisten und Klarinettisten, deren Freundschaften zur Schaffung von einigen der besten Werke jener Tonkünstler führten. Genauso war es bei Spohr und Hermstedt. Spohr begann sofort mit der Arbeit am Klarinettenkonzert Nr. 1 in c-Moll. Mit der Partitur fuhr er im Januar 1809 nach Sondershausen, um sie mit Hermstedt zu besprechen. Zu jenem Zeitpunkt wusste Spohr noch wenig über die Stärken und Schwächen der Klarinette, auch wenn er mit ihrem Tonumfang vertraut war. Er gedachte, seine Partitur mit Hilfe von Hermstedts Rat umzuschreiben. Aber der Klarinettist mochte das Konzert genau so, wie es war, und er versicherte Spohr, dass er stattdessen sein Instrument der Musik entsprechend anpassen und erweitern würde. Und so geschah es auch, wobei er wichtige Entwicklungen bezüglich des Tonumfangs und der Flexibilität der Klarinette in Gang setzte, die unter anderem eine Erweiterung von fünf auf dreizehn Klappen zur Folge hatte. Hermstedts Umgestaltungen und Änderungen wurden im Vorwort zur ersten Ausgabe des 1812 als op. 26 veröffentlichten Konzerts festgehalten. Hermstedt war der Solist in der Uraufführung des Konzerts am 16. Juni 1809 in Sondershausen. Daraufhin nahm er das Werk auf Konzertreise. Es hatte einen großartigen Erfolg und befestigte Hermstedts Ruf als führenden Klarinettenvirtuosen jener Zeit, einen Ruf, den er sich nur mit Webers Protegé Baermann teilen musste. Natürlich wollte Hermstedt mehr davon haben. So schrieb Spohr 1810 sein Klarinettenkonzert Nr. 2 in Es-Dur op. 57 sowie zwei kurze Konzertstücke, die Variationen in B-Dur WoO15 über ein Thema aus seiner Oper Alruna (1809) und das Potpourri in F-Dur op. 80 (1811) über zwei Themen aus der damals beliebten Oper von Peter von Winter Das unterbrochene Opferfest. Als Gegenleistung spielte Hermstedt im November 1811 im Orchester der ersten Inszenierung von Spohrs Oper Der Zweikampf mit der Geliebten. Dort schrieb der Komponist für seinen Klarinettisten eine spezielle Arie mit Soloeinlagen für dessen Instrument, die Arie „Ich bin allein“, die er später in seinen Faust von 1813 übernahm. Das nächste Mal traf Spohr Hermstedt in Wien, wo der Komponist eine Stelle als Orchesterdirektor am Theater an der Wien angenommen hatte, die er von 1813–15 innehatte. Der Sieg über die Franzosen, der Napoleons Exil auf Elba zur Folge hatte, führte zur Versammlung von Diplomaten der am Krieg beteiligten Staaten in der habsburgischen Hauptstadt, zum Wiener Kongress. Musiker sahen hier eine Möglichkeit zum Geldverdienen. Beethoven, Weber und Spohr gehörten zu denen, die patriotische Kantaten schrieben. Hermstedt gesellte sich im Herbst 1814 zum Musizieren hinzu. Der Klarinettist mochte Spohrs kurz zuvor komponiertes Potpourri für Violine und Harfe sehr und bedrängte den Komponisten, ihm davon eine Bearbeitung für Klarinette anzufertigen. Spohr reagierte darauf mit der Fantasie und Variationen über ein Thema von Danzi in B-Dur op. 81, ein Werk, das man gewöhnlich in der Fassung für Klarinette und Streichquartett hört. Spohr verließ Wien im März 1815 und nahm wieder das Leben eines reisenden Violinsolisten auf. Er blieb allerdings mit Hermstedt in Verbindung und komponierte ein Notturno in C-Dur op. 34 für das Sondershausener Hautboistenkorps. Nach einer lang ersehnten Italienreise wurde Spohr Opern- und Musikdirektor am Stadttheater in Frankfurt (1817–19), bevor er sich wieder auf Reisen nach London und Paris begab. Er ließ sich schließlich mit seiner Frau und seinen drei Töchtern in Gandersheim nieder, der Heimatstadt von Spohrs Eltern. Dort tauchte im Mai 1821 Hermstedt mit einer dringenden Bitte auf. Die Direktoren der Badeanstalt im Kurort Alexisbad fragten bei Spohr an, ob er in der kommenden Sommerspielzeit ein Konzert geben könne, und Hermstedt bat Spohr inständig, ein neues Konzert für ihn zu komponieren, das er in jenem Konzert zu spielen versprach. Der Komponist stimmte zu, und das Klarinettenkonzert Nr. 3 in f-Moll WoO19 erlebte so am 27. Juli 1821 in Alexisbad mit Hermstedt als Solisten seine Uraufführung. Der Abend verlief für das Publikum allerdings nicht gerade gut. Spohr erinnerte sich, wie sich ein gewaltiges Gewitter mit sintflutartigen Regenfällen entlud und der Lärm jeden Versuch des Musizierens zunichte machte. Das Gewitter flaute schließlich ab, und das Konzert begann. Durch den späten Anfang kam das Konzert allerdings erst Mitternacht zum Abschluss. Da entdeckte das Publikum, dass das umgebende Tal durch das Unwetter überflutet war und sie festsaßen. Verpflegung und Unterkunft waren knapp, und viele Gäste mussten die Nacht unbequem auf Stroh gebettet in den Badeanstalten verbringen, bevor sie beim Morgengrauen wieder aufbrechen konnten. Gegen Ende 1821 erreichte Spohrs Laufbahn durch seine Ernennung zum Kapellmeister am Hof in Kassel einen wichtigen Wendepunkt. Dort verblieb der Komponist bis zu seinem Lebensende. Hier in Kassel schuf er das Klarinettenkonzert Nr. 4 in e-Moll WoO20, das er im August 1828 skizzierte und im Januar 1829 orchestrierte. Es gehört zu Spohrs feinsten Kompositionen und wurde mit Hermstedt als Solisten am 12. Juni 1829 beim Nordhausener Musikfest uraufgeführt, wo der Komponist auch seine anhaltende Liebe zu Mozart demonstrierte, indem er in einer Aufführung von Mozarts Klarinettentrio KV 498 die Bratschenstimme übernahm. Das vierte Klarinettenkonzert, das einzige Spohrs für A-Klarinette, ist zwar mit Allegro vivace überschrieben, beginnt aber mit einem düsteren romantisch klingenden Thema, dem ein gelasseneres zweites Thema gegenübergestellt wird. Diese entspannte Atmosphäre wird aber von einem kraftvollen, wenn auch kurzen Ausbruch des Orchesters unterbrochen. Das Larghetto ist nachdenklich und melancholisch und hat aufgrund der deklamatorischen Passagen und dramatischen Arpeggios opernhafte Züge. Der Schlusssatz, ein Rondo al espagnol, scheint an der Oberfläche ein fröhlicher, gut gelaunter Satz zu sein. Dahinter versteckt sich allerdings ein Gefühl der Trauer, die von der das Geschehen beherrschenden Tonart e-Moll genährt wird. Das Thema vom Beginn des Werkes klingt am Ende in den Arpeggiofiguren wieder an. Spohr schuf schon früher einen Schlusssatz mit spanischer Färbung, nämlich im 6. Violinkonzert, das er im Winter 1808–09 komponierte, nachdem er einen bei ihm in Gotha einquartierten spanischen Soldaten gehört hatte, der auf der Gitarre seine heimatlichen Weisen spielte. Spohr nahm diese spanische Anregung auch in einer Reihe anderer Werke auf, wie zum Beispiel in einem Streichquartett, einer Oper und eben in diesem Klarinettenkonzert. Offensichtlich gibt es in keinem dieser beiden Klarinettenkonzerte Raum für eine Kadenz. Der Komponist war nämlich der Meinung, dass Kadenzen den schlimmsten Seiten von Solisten Vorschub leisteten, und wich ihnen deshalb im Allgemeinen aus. Sowohl das dritte wie auch das vierte Konzert blieben unveröffentlicht und unbekannt, da Hermstedt bis zu seinem Tod 1846 an den Manuskripten festhielt. In seinen Memoiren schrieb Spohr, dass er vom Verbleib dieser Werke nichts wüsste. Erst zum 100. Geburtstag des Komponisten 1884 erschienen Bearbeitungen für Klarinette und Klavier im Druck. Zur gleichen Zeit stellte man handschriftliches Leihmaterial für Orchesteraufführungen zur Verfügung, aber dafür wurde keine große Werbung betrieben. Es sollte unserer Zeit zukommen, diese feinen Konzerte wiederzuentdecken. Ihr Revival erhielt mit der Entdeckung von Spohrs handschriftlicher Partitur des 4. Konzerts 1960 einen Aufschwung und mündete 1976 in eine wissenschaftliche Ausgabe. Bedauerlicherweise gibt es das dritte Konzert noch immer nur in handschriftlicher Form, doch führte das Interesse an Spohrs anderen Konzerten dazu, dass Klarinettisten sich auch diesem zuwenden. Spohr komponierte nur noch ein weiteres Werk für Hermstedt. Im Spätsommer 1837 schrieb der Klarinettist im Auftrag der Fürstin Mathilde von Schwarzburg-Sondershausen, Schwiegertochter des Fürsten, mit der Bitte um eine Liederreihe für Sopran und Klarinette solo. Daraus entstanden die Sechs deutsche Lieder op. 103. Der sich dem Ende seiner Laufbahn nähernde Hermstedt nahm zwei der Lieder in sein letztes, im August 1841 stattfindendes Konzert auf. Er hatte seinem Komponisten gut gedient, denn insgesamt regte Hermstedt zur Schaffung von zehn Werken mit Klarinette solo an, die als Werkgruppe zu Spohrs einfallsreichsten und attraktivsten Kompositionen gehören.